We’ve added a new feature to our blog – the ability to read our current and past newsletters. Simply click on the newsletter link in the menu at the top and you’ll be set. In the meantime, here are some excerpts from our most recent newsletter (September). Looks like it’s going to be a very bizarre winter this year. The Old Farmer’s Almanac for 2014-2015 predictions just came out a couple weeks ago – the first publication was in 1792 and their predictions have been 80% on target. The almanac predicts a “super-cold” winter in two-thirds of the country, or what Editor Janice Stillman calls “a refriger-nation. In the Phoenix area last year – our winter was like spring, or early summer with temperatures in the 80’s. Three weeks ago we had the most rain ever in the Phoenix area with freeways even flooding. Cold weather brings out aches and pains that we forgot we had, as well as colds and flu. Therefore in preparation for winter we are reminding you of our most important products to fight off illness. This product combines all the wonderful benefits of the Eucalyptus Oil with Lavender, which is one of the more important oils known for calming, breathing, pain relief and the list goes one. I may be having an increase on this product in the near future, due to the price of Lavender spiking This lovely, relaxing blend, is extremely effective in calming the mind, body and relaxing muscles,while relieving pain for extended amounts of time (if massaged in deep). I have used this blend on many animals with spine and hip issues and it works wonders. Applying a moist heat bag after massaging also is very effective in relieving pain and reducing swelling. Especially in cold weather the addition of heat after massaging brings amazing relief. This is nice to use at before bedtime for calming and relaxing and bringing a restful nights sleep. I also apply the “Lavender Comfort Balm” under my nose, as it tends to relax the facial muscles, especially if you are a jaw clencher, teeth grinder. For headaches and migraines massage into the neck and shoulder area, as well as a little on the temples. You can also spray a flat cotton pad, hold tight at the nose area – and breathe in deep. Lavender oil has a calming effect as well as is very soothing for muscles and nerves. This is a powerful blend of essential oils for congestion and breathing – but also for headaches. 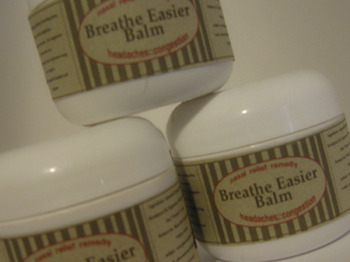 This more powerful decongestant Eucalyptus balm blended with all natural essential oils. Very effective in clearing congestion due to colds, allergies, sinus problem & related ailments. Applying a small at the nose area, will help to clear sinus & bronchial passageways within a few seconds. I use this for headaches, by rubbing on my temples – and breathe in for the aromatherapy benefits. The 1 oz for $14.00 will last up to 6 or longer. It is very potent so just a tiny bit is needed. 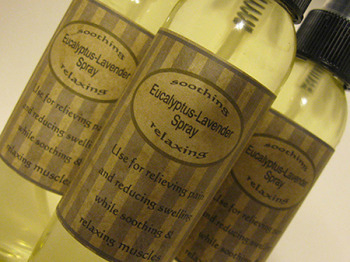 We also offer the Comfort Breathe Easier Blend with Lavender Essential Oil added. This soak should really be called “The Divine Soak.” A soak with an aroma that is like no other – a blend of Eucalyptus Oil with Sweet Birch (has analgesic, anti-inflammatory properties) nothing like a foot for tub soak to help in relieving pain and discomfort as well as easing breathing ailments, & headaches. A very concentrated soak and you can actually see the essential oils glistening in the container. Sweet Birch is a harder to come by oil and similar to Wintergreen but more of a premium oil. It’s a sweet smelling mint. There is so much oil in this SOAK, that I have to wrap electrical tape around the cap – and at times the oils will leak through. It’s potent to say the least and just a little goes a long ways. If you are on blood thinners, have issues with high blood pressure, heart ailments of if pregnant or nursing – this soak is not for you. One of the most popular products in the line – extremely rich, a highly concentrated Eucalyptus Balm, with warming and cooling. This balm is a superior product, more for spot pain, trigger points or smaller areas – I do not recommend this product for all over body massage but is very effective in massaging into a sore muscle or joint as well as great as a chest rub – a very concentrated product – only a small amount is needed for massage. 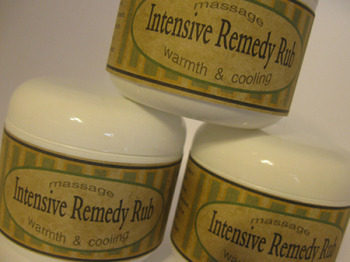 The Intensive Remedy Rub has a pleasant warming and cooling effect and excellent massage quality – and the aroma is so nice. Use for relief of arthritis, rheumatism, sciatica, neck & back pain, headaches, migraines, muscle & joint pain, fibromyalgia. 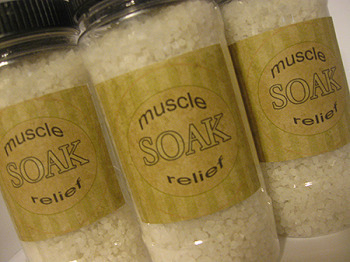 1) Rub into muscle or joint to reduce swelling and release toxins from muscles. This is the product you want to have close on hand for a traumatic injury or fall as it’s a thinner product that penetrates very fast into a muscle or joint to reduce swelling and inflammation very fast. When I was working events, I always, without fail, used this product first for massage on most pain situations – including sciatica, headaches, fibromyalgia , arthritis and so much more. This is great for sprains, strains and you will find less swelling and bruising if you apply immediately and massage in well. 2) “Five Star Tip” Spray a flat cotton pad -attach to your air or heater in your car to help protect you from getting sick. Dispersed through the air can inhibit the spread of infection. (A favorite of mine) Spray your pillow at night as well as your animals bedding. For problems such as asthma, allergies, sinusitis, or bronchitis, you can rub Eucalyptus on the chest and under the nose to open bronchial passageways and loosen congestion. 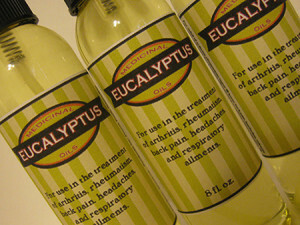 Eucalyptus rejuvenates red blood cell functioning, creating more oxygen for the lungs. You can also spray it on your pillow at night to help keep airways open. This is very important for someone with chronic or serious respiratory disorders. Spray Eucalyptus on a napkin and clip to any fan or register or simply add to your humidifier.…Eucalyptus will inhibit the spread of infection. 4) Take 1 ounce of Pure Eucalyptus Oil and mix with 7 ounces of distilled water to use in controlling bed bug eggs and dust mites. Spray bedding, as well as spray one or two sprays into rinse cycle or dryer to make your sheets and towels smell heavenly. This blend is good to use in the shower, steam room or sauna as it’s not greasy and won’t leave an oily residue. 6) Spray a napkin – attach to ceiling fans to purify air and help aid with breathing ailments. Also spray air filters before installing. I use this everyday on my fans. 7) Veterinarians use eucalyptus with horses with influenza, dogs with distemper, and a variety of animals with parasitic skin problems. It’s also amazing for massaging animals with arthritis and joint problems. I use have used this for dogs I have rescued with congestive heart failure -my Golden has, at 16 years old has breathing problems occasionally and I spray 3 or 4 times around him as well as under his neck area. Use for comfort on animals with a collasped trachea. Eucalyptus spray repels flies and mosquitoes, as well as fleas and ticks for your pets. Apply the oil to exposed areas of your skin before heading outdoors. For your pet, spray between the shoulder blades and on their bed. 11) Kills germ and disinfects skin abscesses and wounds. 12) Use to stimulate and refresh the mind and helps in overcoming sluggishness. During times of emotional overload, it can restore balance, improve concentration and increase intellectual capacity. 13) Can cool the heat of anger. After a fight or conflict, diffusing eucalyptus oil through the room will cleanse the environment.